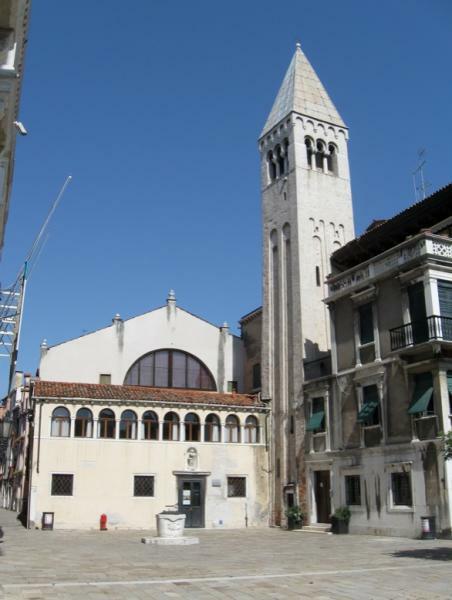 Next to the Palazzo Grassi on the Grand Canal, San Samuele (like San Giobbe and San Moisè, dedicated to an Old Testament prophet) was an ancient church rebuilt in 1685, and still retains its fine old campanile and Gothic apse. Its original front portico was enclosed, leading to its current unusual façade. It is often called upon to take some of the cultural overflow of the Grassi’s blockbuster shows. Of its original interior decoration, there's a 14th-century crucifix attributed to Paolo Veneziano and a recently restored 15th-century fresco cycle in the Gothic apse, generally attributed to Paduan artists, featuring Christ and the Evangelists, Sibyls and saints. Omini becchi e donne puttane. It just figures that San Samuele was Casanova’s parish church; the self-styled ‘Cavalier de Seingalt’ was born nearby in 1725, in Calle Malipiero (with a plaque), near the long gone Teatro di San Samuele, where his theatrical parents once performed. Some of his earliest romantic escapades took place nearby, in the Palazzo Malipiero in Campo San Samuele; there are fine views across to the Ca’ Rezzonico—which you can reach via one of the three traghetti (gondola ferries) that cross the Grand Canal.